Motion Study is a blog series about people, things, and ideas in the arts, design, and technology. General Intellect was a multi-platform exhibition that I curated in October 2015 during Aktionsart's temporary residence at the former Morningside Academy school in South Lake Union. A major project, General Intellect was exhibited on monitors throughout the school and online in the Aktionsart Amazon Art Gallery. This was the first new media artwork on Amazon Art. This new work from Seattle-based artist James Coupe questions the value of digital and cultural labor, the shifting conditions of exploitation and the new forms of social alienation that we face today. 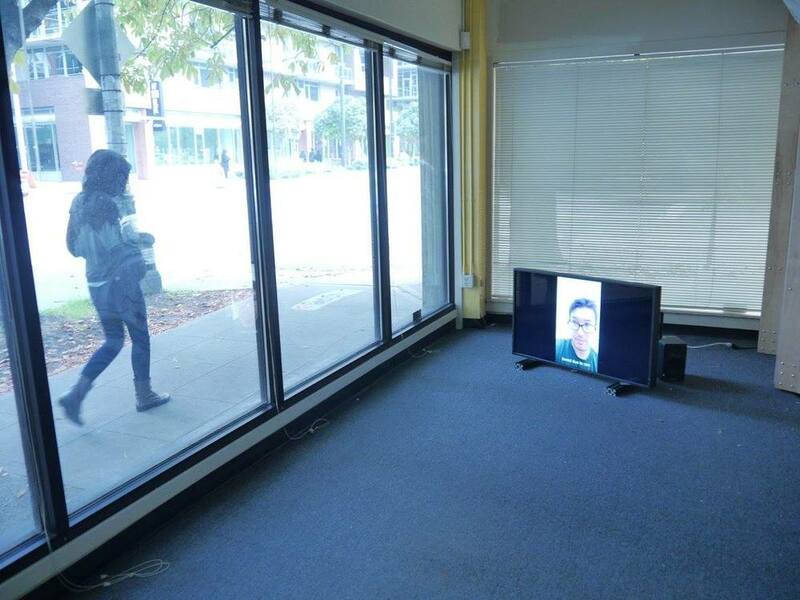 Featuring a generative database of 3,000 videos produced by workers hired through Amazon’s Mechanical Turk (mTurk) service, the exhibition displayed single and multi-channel video installations throughout an entire decaying school building in South Lake Union. Coupe made the individuals behind mTurk visible by instructing workers to record a one minute video each hour from 9AM and 5PM, thus creating an archive of their regular daily routine. Mechanical Turk is an online labor market that was inspired by the vision of humans helping machines to perform tasks. Comprised of over 500,000 workers around the world, mTurk distributes human intelligence tasks (HITs) which computers are not yet capable of completing, such as image recognition and filling out surveys. The tasks typically contain little information about who generated them or how they will be used. This marketplace is named after an 18th century life-sized, mechanical figure - “The Turk” - who travelled the world playing and winning chess matches against notables such as Napoleon Bonaparte and Benjamin Franklin. It was later revealed that the machine was an illusion and The Turk was controlled by a human chess master hidden inside a concealed box. General Intellect is presented as a series of single and multi-channel videos, each automatically generated from a set of unique queries to the database of videos uploaded by mTurk workers. Designed by the artist, queries are based upon demographic information and other metadata provided by the workers. Each query is available for purchase and is accompanied with an annual subscription that funds the cost of workers to complete further HITs based on the properties of that query. As the workers produce more content, the results from the queries change and the videos continually update. The database expands and generates new content through the act of collecting, positioning the collector within a specific socioeconomic relationship with the workers that their query employs. Definitely, definitely check out this exhibition curated by Julia Fryett while you can. This meaningful exploration of labor and digital economy is part of‪#‎sdf2015‬ ‪#‎designforequity‬. Would the video artists (they ARE video artists, just as much as the artist who convened the work's infrastructure is) be intrigued, worried, angry, glad? Would they have been so open with their lives if they had known? Possibly no - or possibly yes - and possibly even more open. And of course this is total self-representation, people showing exactly what they want in their videos, with no other direction than "one minute long video, once an hour, during the workday." I wonder what they thought the purpose was for - market research, product testing/comparison, art, a fetish thing, something else? Mechanical Turk workers are already organizing themselves; they do not need an art exhibit to humanize their labor. Though this exhibition does exactly that. It is perfectly located in its doomed site in SLU; I hope the Amazons stop by. It's so complicated. So it's worth checking out. This is one of the most thought provoking works I have seen in a long time. Go. This prompted me to invite Susan, James Coupe (artist, General Intellect), and Sean O’Connor (Boeing International Professor, University of Washington School of Law) to join me in a casual email conversation discussing some of the theoretical components of the work which were not addressed in the various press coverage. While we certainly did not touch on all the complex issues raised, the conversation that follows provides some additional frameworks for thinking about General Intellect. Now that the exhibition of General Intellect in the school has closed, the work is living online in Aktionsart’s Amazon Art gallery. When I first learned that General Intellect was created on one Amazon marketplace, mTurk, I was immediately interested in distributing it via a second Amazon marketplace - Amazon Art. This would allow the action of selling the work to reflect the act of producing the work, drawing attention to the transition of a work of labor into a work of fine art. Jen Graves: "Does Amazon register the irony? Are they playing along? "Yeah," Fryett said. "Yeah"? Not really. I have never described, or implied, that this gallery is ironic. It exists as a serious venue that extends the reach of our exhibition program. I'm encouraging artists to use this virtual platform as a site-specific venue for interventions and for testing entrepreneurial ideas that connect art with new audiences. A key influence for me was Claes Oldenburg’s The Store. He opened it in 1961 in the Lower East Side of Manhattan, selling sculptural objects of commonplace objects such as ice cream, hats, shoes and cigarettes. The idea of employing the aesthetics of a storefront display remains intriguing, particularly wit the rapid expansion of art e-commerce platforms. General Intellect hires workers to film short clips of their daily life, then sells these videos to art collectors along with a subscription package that then hires workers to create new videos each week. The project therefore creates a third marketplace - a specific micro economy that allows collectors to become employers. This third marketplace did not exist during the initial iteration of General Intellect in Bath, before it was made available for purchase by art collectors. How does the act of selling the work change the work? How is it possible to re-sell labor, from a legal perspective? Some insight into the legal framework and contractual obligation of Mechanical Turk would be useful to go over, in order to illuminate some of the decisions James made when designing the system of General Intellect. Just one very quick thought before I run out the door. It hadn’t occurred to me before that anyone could think the decision was ironic. While “irony” is not a word I’d use to describe this choice, it did strike me as hypercompliance – or an aggressive and intentional compliance with the market forces addressed in the work. What else could possibly be done with this material? It does feel right. This also, interestingly, puts Julia, as curator, in the position of creating the artwork in a fairly atypical way - as the retail and distribution mechanism becomes a component of the work. Some thoughts here following from the comments below and in Jen Graves’ piece. 1. Are there parallels to psychological research projects in which it is important that the subjects NOT know what is actually going on? 2. If so, what about the IRB (institutional review board) process that would normally occur today with regard to research involving human subjects? Would IRB review have approved General Intellect as is, or would it have rejected entirely, or required changes? Perhaps the project itself would be approved, but not the public release of the videos and/or the subsequent sale of the videos? 3. At the same time, the subjects had already opted in to the mTurk commercial construct. But two questions: have the mTurk workers actually read whatever ToS Amazon requires them to click through to participate in mTurk (or is mTurk participation already covered by general Amazon ToS? ); and if not, do they have some rough sense of what they think the “deal” is for participating in mTurk? 4. What ToS applies to mTurk employers such as James in this project? Imagining Amazon as a store is being very generous to them - maybe like Oldenburg, they are borrowing the tropes and conventions of a store in order to condition our thinking about commerce. In reality, Amazon's reach is vast - mTurk, cloud storage, databases, video, AI, etc. One of the rationales about having General Intellect end where it began - in Amazon's marketplace - is to challenge our thinking about such entities as purely front-end stores. Amazon is in the same category as Facebook, Google, Microsoft, etc. It's a machine that is attempting to monopolize fundamental aspects of our everyday lives. I don't intend that interpretation as an anti-Amazon critique - I use Amazon too, and it uses my data. Amazon is a platform that tells us a lot about who we are today and it's important to explore it as a site for artistic inquiry. I think Jen Graves' second article about General Intellect missed this - putting the work back into Amazon's storefront was conceptually necessary in order to fully articulate the work's ideas and understand its scope. The work is not an object, and neither are the videos - it's a system that is fully intertwined with the Amazon machine and relies upon it to sustain its critical position. I don't really see the work's presence for sale on Amazon as being about selling it. I see it as a necessary site for the work - and in light of the status of Oldenburg's The Store as one of the early examples of Pop Art, I think there is some common ground there. Oldenburg could occupy a unique conceptual position with his work by bringing it out of the (high culture) gallery/museum and into the (low/popular culture) "store". Being in that marketplace is what counts conceptually, i.e. being available for sale, not selling it. I think if someone bought one of the General Intellect queries they would only do so with an awareness that the transaction was an engagement with the conceptual underpinnings of the project. There aren't too many artworks that operate that way - i.e. that consider the commercial distribution of the work as a core, ongoing, generative part of it. Most works, regardless of their subject matter, can be bought, sold and collected by the very people who they claim to critique. A Trevor Paglen photograph of a classified military location, for example, has no mechanism within its distribution methodology that holds accountable the person whose wall it ends up hanging on. If the General Intellect videos were to be sold on DVDs through a regular gallery, they would become objects that could not sustain the critical position that they do by being for sale on Amazon with the proceeds being used to hire more mTurk workers to generate more videos. I agree with Susan that consent is at the heart of the work. It's one of the things that make it a complex experience - we don't know where to position ourselves in relation to the workers. We occupy a privileged position simply by viewing the work - i.e. we can see the full picture and they cannot. I think this is a difficult critical position for the work to adopt, but I think artists have a responsibility to take these on. Much of the work's power is derived from its ambiguous relationship with consent and the discomfort of our own position in respect of that. It is a situation that forces us to ask ourselves important questions about our own roles within platforms that rely upon dynamics of privilege, exploitation and automation. We benefit from the convenience, but at what/who's cost? We derive value from the videos, but feel voyeuristic and culpable at the same time. Here the differences from Oldenburg's store become pretty clear. The ethics and implications of a 'shared', data-driven, individuated marketplace open up a different set of problems to those of a bricks-and-mortar store. Deciding how much information to give the workers about the purpose of the HIT was an important decision I had to make with the work. For the record, workers were told in the HIT that the videos would be displayed publicly, alongside those made by other workers. Yet MTurk is an extremely compliant environment - people want to get paid, and the system is set up in such a way that workers often don't get paid if they don't do the HIT to the satisfaction of the requester (and allegedly in some cases, even when they do). And so I felt it was important not to provide information that was going to direct workers to respond in the way that they would think I wanted them to. I wanted them to feel unrestricted as to what they did with those eight minutes of video. And you saw a large range of responses, all of which were valid. And indeed if you look on the mTurk forums and the emails that some workers sent to me, this HIT was popular because it provided an opportunity for workers to do something they found interesting, and because it paid what it promised. I hope this makes some kind of sense. I'm still struggling to reconcile my relationship with this project, it's complex to unpack. But I take that as a good sign. Hasn't Amazon simply become the new archetype for "store"? They changed the game. To exist, a store must now also be a big data company. I remember reading Werner Vogels, Amazon's CTO, say that they are a tech company who "just happens to do retail". This is why I find the relationship with Oldenburg so compelling in considering what "storefront" and "store" mean today. If we think of tech companies as stores (indeed, doesn't selling data position every tech company squarely in the commerce business? ), then perhaps the "storefront" represents a public facing, virtual front end and the "store" is everything we don't see. The storefront is an interface with the invisible. How then can new media artists work with these facades to create and present work? Frequently we see artists use a particular platform solely for distribution/exhibition, without considering the platform as a site-specific environment. But General Intellect does precisely this. As James suggests, to bring the work outside of the system it creates would be a failure. I'd like to see more artists moving away from creating safe distances/thrones from which to critique, and more into these complex spaces of hypercompliance (love that term, Susan). Amazon is a "store" not only in the retail and commercial sense, but in every way that word is used. Store in the sense of stockpile or repository, a bank of things that can be summoned or retrieved at will - the big data. Except that as much as the data is data, the items are also data; they're merely interchangeable cargo. And the whole operation is an always changing, buzzing, active thing - to store, the verb. It's rather startling that the HIT can earn the affection of workers simply by doing what it is supposed to do, and paying what it promised - if you aren't rejecting any of the videos on the basis of their content and quality. Did you display the actual HIT with the work? Knowing all of the components of the work, including the form and content of the task itself, seems to be just as integral as the format in which is presented and displayed. Is the digital Amazon gallery / storefront more of an ideal site or home for this work's display and existence, in addition to being integral to the work's total form, versus the life it takes on when it is displayed in gallery spaces like the one where it was shown in South Lake Union? The HIT wasn't displayed at the exhibition of General Intellect in the school, however James and I did speak about it early on. I'll leave that up to him whether or not he wants to publish the screenshot. From a curatorial perspective, both of the venues (the school and Amazon Art) were equally integral to the presentation of this project. The site-specificity of the decaying school building led to a powerful experience of the work. Each monitor was alone, in a room, which certainly heightened the sense of alienation that perhaps some of these worker's felt. The location of the school in South Lake Union next to Amazon's headquarters was vital, as it is one of the only remaining original structures on Westlake Avenue. The school previously was a print shop, built in 1918, and will soon be demolished - an impending sense of destruction which also reflects the eventual farming off of the mTurk tasks to AI. None of this experience is conveyed on the Amazon Art gallery. Rather, here we have quite a dry presentation of the work in an entirely different, commercial "storefront" setting. Clips of the videos are shown, so the viewer receives a minimal glimpse into the depth of the project. This digital environment brings the ethical and economic concerns behind the work to the foreground in a way that is much more provocative than the school installation. When placed squarely back within the Amazon system, General Intellect suddenly became uncomfortable. Why is this? Does offering the work for sale cross a line and, if so, what does that line represent? Back to Susan's point about hypercompliance - Turkers operate within a system that is contractually designed to remove agency. By opting in, they opt out. Perhaps knowingly, perhaps not. General Intellect likewise operates within the system of mTurk. It's a closed loop. I totally agree about the hypercompliance framework, which makes me think of discussions around post-internet art. I think General Intellect makes sense in the context of the internet, digital media, etc. no longer being required qualifiers for anything, where the economic, labor, social, aesthetic properties of our lives can't be separated from the internet any longer. Last year I saw Florian Cramer talk about post-internet art, and he made a distinction between work that used the internet's existing structures, distribution methods, spaces, etc. from work that had to invent those kind of systems (thus distinguishing post-internet art from the majority of "new media" art produced over the last few decades, which has often required artists to invent new systems entirely). I find this refreshing - a better integration of concept and material/technology and a means to thoroughly investigate what these sites mean - spaces like Tumblr, Instagram, Facebook, gifs, mTurk, etc. And in order to explore and irritate those places one strategy is to commit to their logic, and follow it through - i.e. be hypercompliant. You can see this in Amalia Ulman's use of Instagram, and it's interesting how each of these spaces suggest different distribution methods because they have different purposes and different logics. So talking about selling things - how are post-internet artists distributing their work... and if they do, does it fit within the conceptual framework/distribution model of something like Instagram, or is it a concession back to the art market by creating physical objects that can be owned in ways a fake Instagram profile cannot? I don’t consider the videos in General Intellect as objects to be analyzed individually, they are parts of a system and their patterns and properties reveal larger issues, regardless of their individual content or quality. This is one reason I organized them via database queries - I see watching them as a way to discover the rules of the system that they are a part of. We see the HIT by seeing the patterns across multiple videos. I saw it as too didactic to exhibit the HIT alongside the videos. Although I am comfortable with the choices I made, from an ethical point of view, in terms of how I interacted with, compensated and assigned tasks to the workers, there is an ambiguity and questioning of the role of the requester there that is in keeping with the logic of mTurk, and I wanted to explore that. Ordinarily the only people who get to see HITs are the requesters and the workers, not the people who benefit from the results, and so I felt it would dilute the work to not comply with this pattern, and it would compromise its critical position. My relationship to this as both the artist and the requester is, as Susan observed earlier, problematic. There isn't a 'correct' position for me in relation to mTurk, and in fact there isn't for anyone - workers, audience, critics, curators, etc. But by performing that role, and using mTurk as a platform/medium to make art, things open up, the issues become visible and real, and it exposes and implicates all of us. The question of an ideal site for the work is an interesting one. From one point of view, maybe I'm not doing a lot - producing an instruction and then benefiting from all of the emotional power that the workers' videos bring with them. However, the development of General Intellect involved a lot of experimentation with finding the tipping point at which I was not being so directive that I was telling workers exactly what to do, but not being so loose that the videos would have been too random. On their own, the videos are one thing, but once they are put back into the system they were designed for, they reveal a pattern and generate something new. And so the works need to be seen together in order to get that. I don't think the Amazon store is a good place for that - it's not really a place to view things, to see the works. It's format (excerpts, browser, small videos) is not how the work wants to be viewed. The work's site is not the Amazon store; that focuses the project on its 'product' too much. I see the store as a conceptually appropriate distribution method for the work, which draws out important aspects of the work, but it is not where the work could solely exist. And like Julia mentions about the schoolhouse as site, there was definitely an accentuation of the project by being there, in such juxtaposition and proximity to Amazon's campus. Picking up on Julia's comment about artists putting their work on thrones rather than directly in the mix - I think we need to decide what art is for. Do we want art to be capable of operating directly within real-world systems, or do we want it to just paint pictures of them. It’s a bit like the difference between a landscape painting and Land Art. It is one thing to make something visible (from a distance), it is another to make the work comply with that thing's logic in order to reveal things that are not readily apparent. The kinds of issues that I think art needs to tackle are really complex, and there shouldn't be safe distance for anyone - artists, curators, artwork, audiences, critics, collectors. I think the work needs to implicate all of us, and frankly traditional media and a lot of the critical vocabularies that accompany it aren't well positioned to do that. For me, Jen Graves' discomfort with the project being put back into the Amazon marketplace exposes some of those conventional expectations of what art is for and where it should be sited and sold. Julia asked what line gets crossed when General Intellect gets made available for sale on Amazon. I think that line is our relationship with the internet and the uncomfortable reality of all the things that that brings with it. Motion Study is a new series profiling cultural pioneers and tastemakers in Seattle. The first post features Anne Couillaud, an independent art curator who recently moved from New York to Seattle.